Dakshineswar is a town in Kolkata, which falls in the Barrackpore subdivision under the Kamarahati Municipality. The town is famous for its landmark tourist spot, the Dakshineswar Kali Temple that is dedicated to the worship of the Hindu Goddess Kali. The place is a wonderful merger of old-world charm and modern facilities and amenities that are important for 21st century living. From top schools and colleges that one can easily locate, to banks and ATM facilities, reputed marketplaces, hospitals, popular roads branching out of Dakshineswar, convenience is another term that you can associate with the place Dakshineswar. 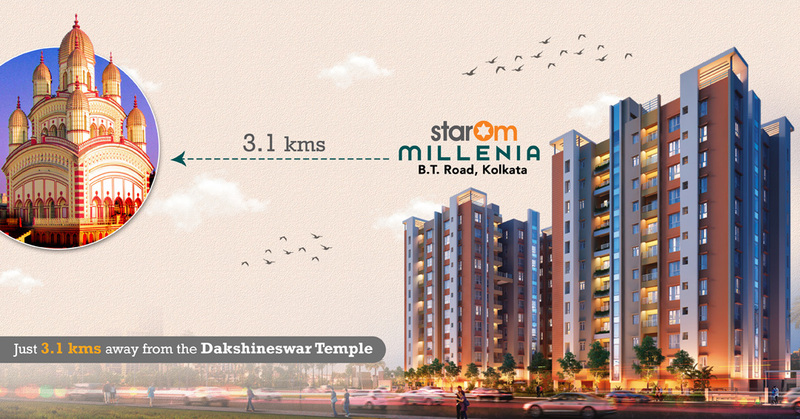 The StarOm Millenia project is situated 3.1 kms from the famous Dakshineswar Kali Temple. The project is constituted of 2 BHK and 3 BHK flats with earthquake-resistant RCC framed structure, ceramic tiles, weatherproof exterior, superior porcelain sanitary fixtures, AC points and more. You can expect wonderful amenities, such as AC Indoor Games Room, AC Gymnasium, Swimming Pool, AC Community Hall and Badminton Court complemented by a wide range of facilities, such as Wi-Fi ready flats, intercom, 24/7 security with CCTV surveillance, car parking facility and much more! 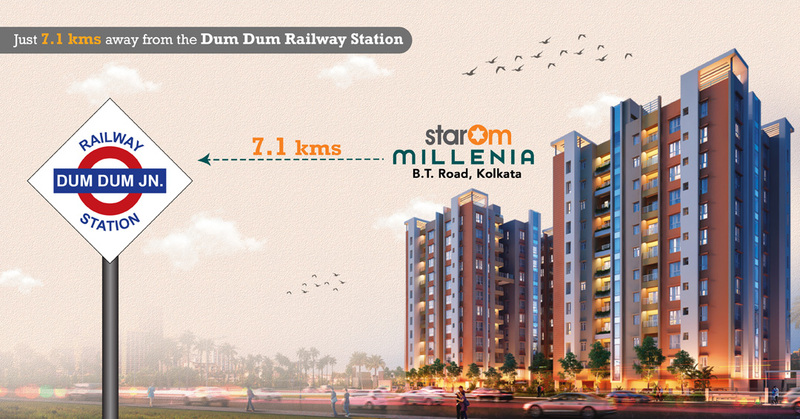 StarOm Millenia is the ideal one stop solution considering several local amenities and is definitely an apt investment opportunity!